For me that path has been depression. I was diagnosed with clinical depression before I had entered the fifth grade. It wasn’t until about high school that I realized I had been experiencing suicidal thoughts. But somehow, even my little 9 year-old brain had figured out that God would be so sad if I “didn’t exist” anymore. By the grace of God, even in all the suffering and mental anguish I’ve experienced in my 29 years here on earth, I’ve become more and more convinced that this cross has been God’s gift to me. That this particular cross of mental illness is my very own path to holiness, if I but embrace it with His help. The same is true for you and your crosses too, sisters. What is your big cross? Maybe, like mine, it’s some sort of mental illness. Or it could be the pain of infertility or an addiction. Perhaps it’s financial struggles or strained relationships within your family. Whatever it is, Jesus wants to help you carry it. He doesn’t want you to shove it in a dark closet and hide it away, trying to ignore it. He doesn’t want you to compare the size or weight or shape of your cross to another’s. He wants you, like He and Simon of Cyrene did, to take it up and use it as a stepping stool to heaven. And in carrying your own cross, you’ll help others carry theirs. "Jesus wants to help you carry (your cross). He doesn’t want you to shove it in a dark closet and hide it away, trying to ignore it. He doesn’t want you to compare the size or weight or shape of your cross to another’s. He wants you... to take it up and use it as a stepping stool to heaven." To compare our cross to another’s is nonsense, sisters, and it’s a trick of the evil one. God wants to hear about our sufferings and He can use them to shape us into more authentic versions of ourselves, if only we open up our hearts to Him and others. 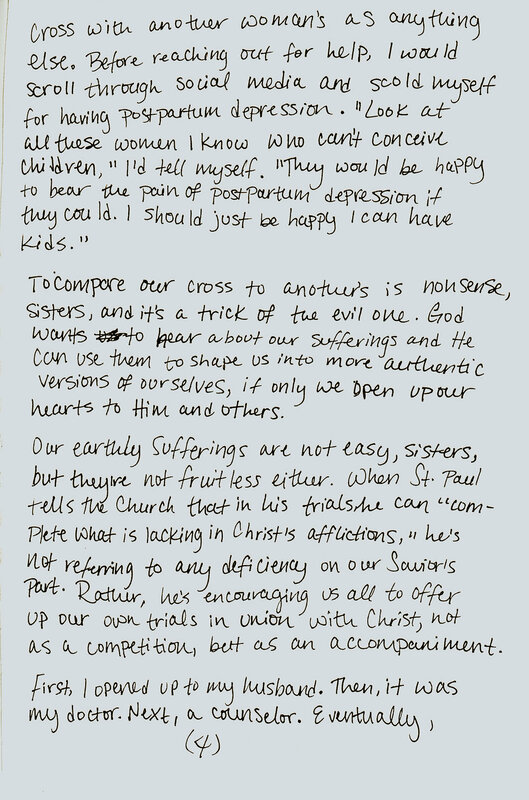 Our earthly sufferings are not easy, sisters, but they’re not fruitless, either. When St. Paul tells the Church that in his trials he can “complete what is lacking in Christ’s afflictions,” he’s not referring to any deficiency on our Savior’s part. Rather, he’s encouraging us all to offer up our own trials in union with Christ, not as a competition, but as an accompaniment. First, I opened up to my husband. Then, it was my doctor. Next, a counselor. Eventually, family members and supportive friends. And now, I’m telling all of you. Hillary is a 29-year old wife, mother of three (one of whom is due in November) located in Colorado. What does "hope" look like in your life? How do you find it when you're in the thick of depression? Looking at my children, I see a lot of hope. Their innocence and beauty captivates me in a way that I know each one of use must captivate our Father. In the midst of depression, I find that picturing Christ's Agony in the Garden is helpful because it reminds me that even our Savior underwent immense physical and emotional suffering during his passion before the Resurrection. That and a good hug from my husband bring me a lot of hope. Since I quit my office job to be a stay at home mom, I've had to look much harder to find meaning in my life. That sounds bad, but I had been earning a paycheck since I was 16 and suddenly I had no tangible evidence for all the hours of my work! Quitting at this point in my life showed me that I had put a lot of meaning in being productive at work. Since then, I've begun to realize that simply being present to my family and loving them is where I find most meaning. Of course, I'm not saying that a mother can't have a meaningful relationship with her family and a career. This is just my situation at this point in life. 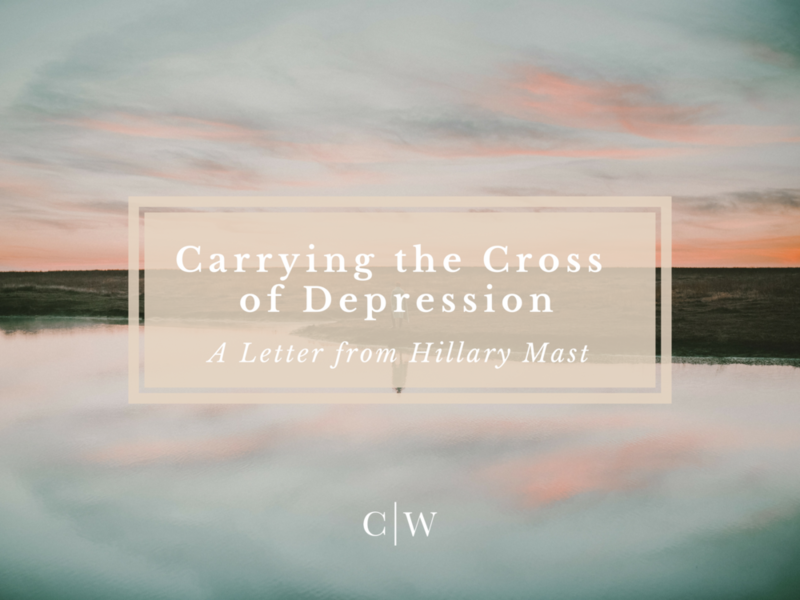 "In the midst of depression, I find that picturing Christ's Agony in the Garden is helpful because it reminds me that even our Savior underwent immense physical and emotional suffering during his passion before the Resurrection." 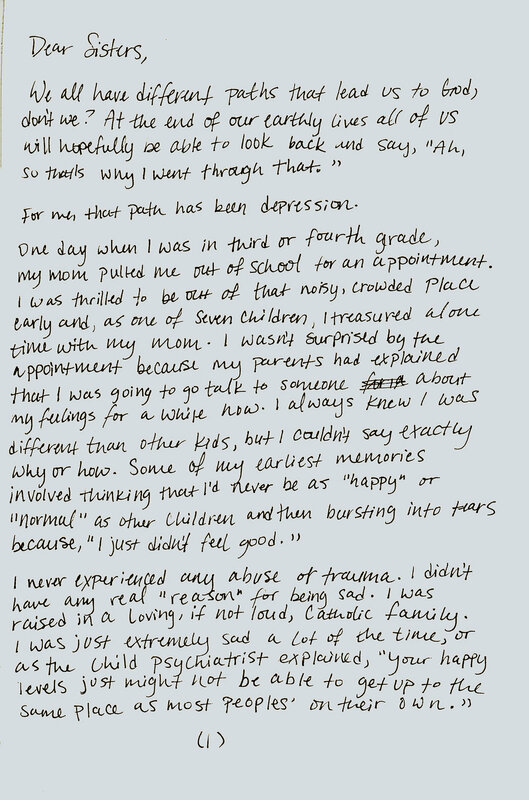 How has counseling helped you through depression? 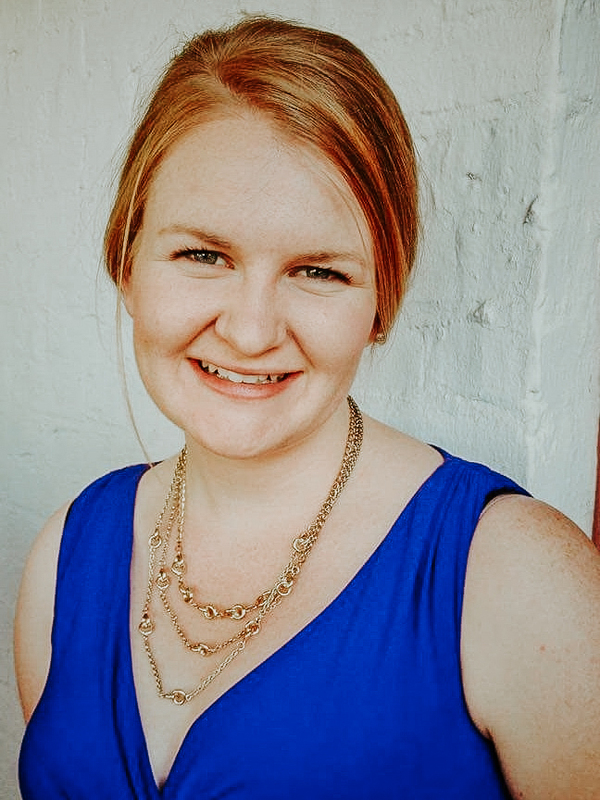 Counseling helped me immensely, especially when I was going through postpartum depression after my second child was born. I realized that this is just something I need to do in order to manage my depression, regardless of how I'm feeling. I've found Cognitive Behavioral Therapy to be especially helpful in battling dark thoughts that can accompany depression. I joke with my therapist that seeing her is like having an emotional accountability partner -- just someone I can keep my mental health in check with. Is there a particular prayer you turn to when you're struggling? The one that I find most helpful is from Psalm 69: "God come to my assistance, Lord make haste to help me." It reminds me that God is the one who is in control, not me, and that He is ready to help me as soon as I call on him. Are there any resources you would recommend to Catholic women who are struggling with depression? I'd recommend searching for a Catholic therapist or counselor through your local diocese. In the Archdiocese of Denver, we have Sacred Heart Counseling. Another good pair of counselors who do remote sessions is Two Hearts Counseling and Healing Ministry. Though not Catholic, a good resource for any mother experiencing postpartum depression is Postpartum Support International. They help women find support groups and counseling in their areas and always have someone available to talk with. Drawing from your own experience, how can we recognize the symptoms of depression in a friend or family member? Do you have any advice on how to reach out to them and care for them? I'll just speak to the symptoms of depression that my mom spotted in me at a young age since these can vary with each person. Mine included feeling hopeless and sad a lot of the time, sleeping too much, having low self-esteem, doing acts of self-harm, talking about people being better off without me, crying for no apparent reason, and lacking interest in things that used to bring me joy. If you suspect your loved one is suffering from depression, ask questions and take the time to really listen. Let them know that they're not a burden and that you want to accompany them and let them know that you're praying for them. Encourage them to get help from a mental health professional, not because they're burdensome, but because they deserve to feel better and because depression is a serious illness that warrants professional help. Something that I found helpful as a child is when my mom would ask me open-ended questions like, "How can I help you?" or "You seem kind of sad today, what's wrong?" My husband is very good at asking me questions like this and listening to me rather than trying to fix the situation. Sometimes I just need someone to listen to me and tell me I'm okay. I think the worst thing you can do is tell someone who seems depressed to "cheer up" or "think of something happy." I'm sure it's well-intentioned, but when someone tells me that all I hear is, "You should be able to just cheer yourself up" or "You need to deal with this yourself." It's hurtful and I feel as if I'm failing by not being able to just snap out of it. Are there any words of encouragement you'd like to offer to those who are currently struggling with this? First, please don't be afraid to ask for help. It can seem overwhelming to take that first step or easier to just ignore it, but depression is a disease that requires treatment. God wants you to get help! Treatment looks different for different people. If you're scared, talk to a trusted loved one first and ask them to help you get the help you need. Second, depression is not your fault. You did nothing to cause it or "deserve" it. Full stop. And third, it will get better. I'm not saying that you'll never feel depressed again. I am saying that with every step you take in fighting this beast, you will get stronger so that the next time it knocks you down you'll be able to get back up and face it better than before.